Jesse enrolls at Ohio State University in September 1933. 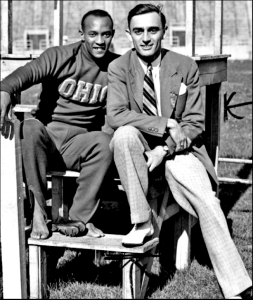 In this era before track scholarships, Jesse’s decision to attend Ohio State is based on a position for himself as an elevator operator in the statehouse and some promise of a job for his father. Ohio State has only one men’s dormitory, which does not permit black athletes. Jesse and his black teammates are forced to live in a house off campus. At the Big Ten Freshman Meet in Columbus, Ohio in March 1934, Jesse sets new conference records in all three events he competes in. The 100 yard dash 9.6 (sec), the 220 yard dash 21.0 (sec) and the long jump 24 feet 10 inches. Starting his varsity career, Jesse beats Ralph Metcalfe for the first time in the semis of the 60-yard dash during the Millrose Games at Madison Square Garden. He wins 3 of 4 events and places second in the 70-yard low hurdles. A few months later, at the Big Ten Championship in Ann Arbor, Michigan, Jesse sets 3 world records and ties a fourth. This feat has never been equaled, making this the greatest single performance in track and field history. Jesse is given the nickname “The Buckeye Bullet.” He competes in 19 meets and never fails to finish in the first three places. 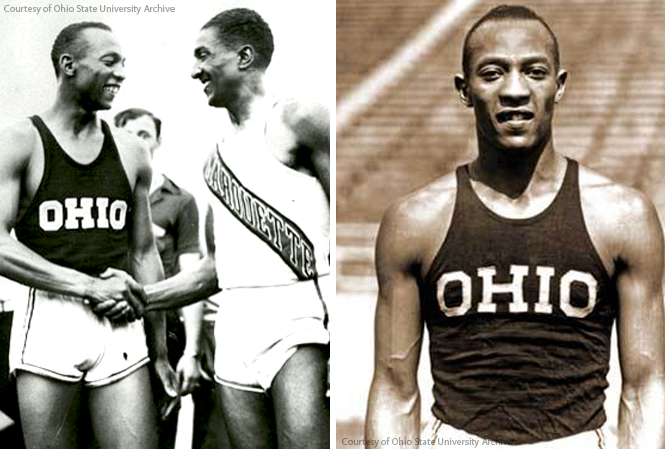 Jesse Owens is considered the premier track athlete in the world. Jesse is undefeated in 42 events for Ohio State. He wins 4 firsts at the Big Ten Championships, 4 in the NCAA Championships and 2 in the NAAU Championships.